The honey-hunting season is under way in the south-western jungles of Bangladesh. But this is by no means the gentle rural pastime it may sound. With a broad flashing grin, Latif Dhali was the grateful recipient of a pair of white women's tennis shoes on the last day of our trip to the jungle of Bangladesh. They were given to him by a tourist who had spent a week accompanying him collecting honey from cones amid the stifling heat of the Bangladeshi mangrove forests. Like other honey hunters, he had up until then ploughed his way barefoot through the thick vegetation in search of the wild bees that provided him with a living. But now, he had a pair of shoes. It was the first that he had owned in his life. 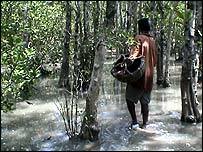 Latif Dhali was like most honey hunters, or Mowalis, from the Sundarbans. He was an inhabitant of one of the numerous villages that surround the waterlogged mangrove forest, which is criss-crossed by rivers and waterways. For two months of the year during the honey collection season he lived on a boat which resembled a giant canoe, no longer than seven metres, deep in the heart of the forest. We followed him and other Mowalis on a honey-collecting odyssey by boat into the far south-west, close to the border with India. Latif Dhali was small and thin, with the skin of a man who had spent most of his time in the great outdoors. The only clothing he had was on his body, which is why a pair of ladies' tennis shoes was such a welcome expansion to his wardrobe. He was extraordinarily fit, often running through the jungle in search of the honey cones, shouting with delight every time one was found. When that happens, there's a flurry of activity. Torches are prepared from the abundance of thick vegetation as the smoke irritates the bees and makes them fly away. But only for a short time. Many realise they're under attack and will repeatedly sting any invader who isn't holding a torch. The honey hunters ignore the stings to collect the cone and wax in a large basket, taking care to leave part of it so that the bees can return and rebuild. On a good day, the hunters can find seven to eight cones. But it's hard work. Often, they're knee-deep in mud, and have to cross numerous rivers, creeks and streams while simultaneously remaining aware of the ever-present tiger menace. Evidence of tigers is everywhere. We came across footprints which my guide said were less than an hour old. Latif Dhali and the other honey hunters were too busy in search of their livelihood to let that worry them. When not braving the jungle, Latif Dhali was a master storyteller. He was one of the few people in his village to have had access to a television during his life. We spent one memorable evening under the stars on the deck of our boat recounting every twist, drama and nuance of an American soap opera that he had recently seen on Bangladesh Television. His storytelling made compulsive listening. It is unlikely that Latif Dhali and his fellow honey hunters would have heard of the Greek myth Jason and the Argonauts. But I think he may have agreed that they had a lot in common. Jason searched for the elusive golden fleece hanging from a tree, travelling a long way by boat to a remote area. The honey hunters, like the Argonauts, also had to travel long distances by boat in search of a trophy that hung from tree branches. They, too, were looking for a golden prize - some of the most highly valued honey in Asia, and were up against equally formidable enemies, including giant-sized bees and the famous Royal Bengal tiger. And, like the Argonauts, the honey hunters often have to pay with their lives in search of the final prize. But it is a reward worth winning - honey hunters can earn as much in two months as farm workers can earn in a year. Latif Dhali faced the dangers of the Sundarbans with remarkable equanimity. He and hundreds of other unarmed honey hunters would be paid danger and hardship money if they lived in the West. The bees of the Sundarbans don't take too kindly to having their homes invaded, and five stings is enough to give most people a severe fever. Every year between 10 to 15 Mowalis are attacked by tigers during the honey hunting season. It is not known why there are so many man-eating tigers in the Sundarbans. One theory is that the high salinity in the water there makes the animals become more aggressive. "We know there is always a risk that we won't come home," he told me. "But this is a job which we and our ancestors have been doing for hundreds of years and we are well aware of the dangers." He said that in the West he had heard that there was a high mortality rate among pilots who spray fertiliser on crops using single-engine aircraft. "I suppose our job is like theirs," he suggested, "dangerous but very exciting." For a while, Latif Dhali would have been able to do that job with the added luxury of a pair of women's tennis shoes to protect his feet against the notorious Sundarbans thorns. But tragically he would not of had long to relish the experience. 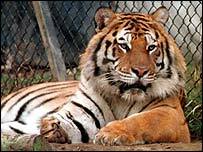 Within 12 hours of receiving them, he was attacked and killed by a tiger. But, for a short while, they were his pride and joy, one of the few indulgences he ever would have experienced.